Wikipedia edit-a-thons are happening all over Canada, just in time for International Women's Day. Learn more about the cause, plus CBC Arts has a list of the notable Canadian artists who weren't on Wikipedia before Art + Feminism got on the job. The names may surprise you. It's among the most popular websites in the world, ranked No. 7 in global traffic, and if you're looking for information on the history of France, or Pokemon taxonomy, you'll land on Wikipedia. If you're there to learn about a female artist, however, good luck. "It's not hard to find people without a page, you know?" says Christine D'Onofrio, a visual art instructor at the University of British Columbia. "It just starts getting a bit depressing." 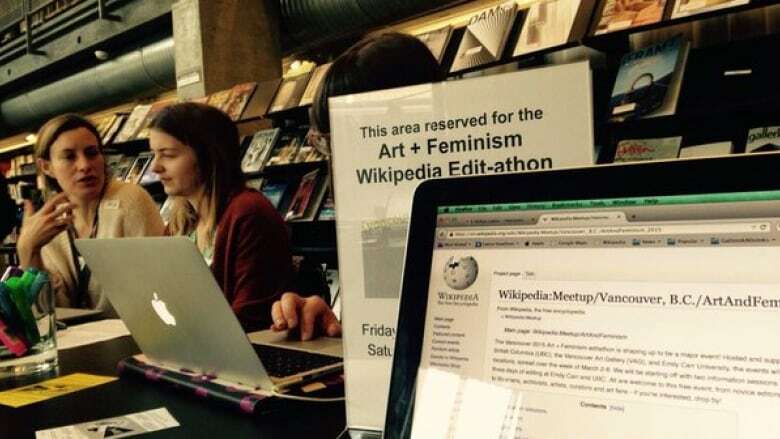 In Vancouver, D'Onofrio hosts the Art + FeminismWikipedia edit-a-thon. Amber Berson, the three-year-old movement's Canadian ambassador, organizes a similar meet-up in Montreal — and she's experienced the same search-function frustration as her colleague. "It would happen constantly," Berson tells CBC Arts. "Or I would find just a couple of lines, not a fully fleshed out article, when in fact there are books and books and books written by this person." If there's one good thing about their problem, it's that anyone can edit Wikipedia. The trouble is that everyone doesn't. According to the Wikipedia Foundation's own findings, less than 10 per cent of all contributors identify as female. So for all its millions of articles (38 million, at last count) written in 250 languages — and its vision of "a world in which every single human being can freely share in the sum of all knowledge" — it's not the world who's creating Wikipedia. It's dudes. Overwhelmingly so. "I imagined it would be bad. I didn't realize it would be so bad," Berson chuckles, talking about Wikipedia's sausage-party demographics, a problem the organization itself is taking steps to address. "But what was surprising to me was the content, and the lack of content about women." "Wikipedia has become a huge resource," says D'Onofrio. "A whole voice is missing because statistically we're actually quite low, people who identify as female. I guess I feel like if knowledge makes history, there's a whole side that's missing to tell their story." That's where the organization Art + Feminism comes in. Founded in New York in 2014 by Canadian Jacqueline Mabey, Siân Evans and Michael Mandiberg, its mission is straightforward: "to improve coverage of women and the arts on Wikipedia and to encourage female editorship." That's why people in Vancouver — and Saskatoon, and Montreal, and more than 100 centres around the world — are getting together IRL this month so they can spend all day on Wikipedia. Organizing their local meet-ups through an Art + Feminism Wikipedia page, anyone who attends will learn the basics of how to edit and create an entry, and then — often with the help of volunteer librarians — they can get to work, joining Wikipedia's mission to "document the sum of all human knowledge" by adding the stories of awesome women, and feminist organizations, in the arts. In Toronto, female Canadian artists are the focus when it comes to building entries. ("Canadian art is really under-represented on Wikipedia, as well," says Toronto A+F contributor, Amy Furness, who's also the Art Gallery of Ontario's Special Collections Archivist). In Banff, editors will be looking at artists with connections to the Banff Centre. "It's complete anarchy in Vancouver!" says D'Onofrio, laughing. "If you have someone you're thinking of [writing about], we would never say no. In 2015, more than 75 cities hosted edit-a-thons and from those events, roughly 400 new entries were created. Another 500 were amped up with new info. This year, A+F says more than 100 venues around the world will be hosting meet-ups. In Canada, there are events happening soon in Vancouver, Banff, Montreal, Saskatoon, Toronto, Winnipeg, Ottawa, Regina and Peterborough. The first aboriginal woman to represent Canada at the Venice Biennale, Rebecca Belmore is an acclaimed multi-disciplinary artist from Vancouver. The Banff Centre's edit-a-thon group worked on Belmore's entry last year, as her sound installation Ayum-ee-aawach Oomama-mowan: Speaking to Their Mother, can be seen at the cultural institution. The piece is a reaction to the Oka Crisis of 1990 and, per Belmore's Wikipedia entry: "Her work addresses history, voice and voicelessness, place, and identity. To address the politics of representation, Belmore's art strives to invert or subvert official narratives, while demonstrating a preference for the use of repetitive gesture and natural materials." A 2013 recipient of the Governor General's Award in Visual and Media Arts, Belmore was notably commissioned by the Canadian Museum for Human Rights last year. The resulting site-specific work, called Traces, is a nine-metre tall blanket of beads formed from Red River Valley clay. One of the founding members of Vancouver artist-run centre The Western Front, Kate Craig was a video and performance artist known for her leopard-print clad persona, Lady Brute. 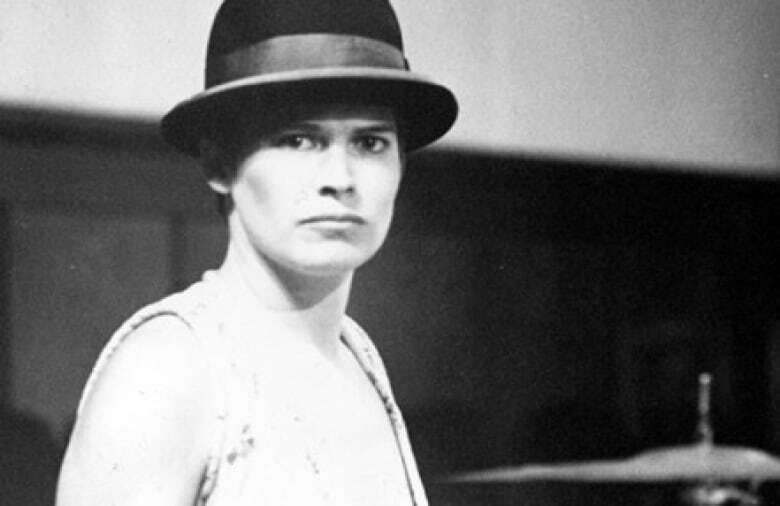 Craig died in 2002 at the age of 54, and according to D'Onofrio, the Vancouver Art + Feminism group created Craig's Wikipedia entry as a labour of love. "She died a little bit younger, and sometimes that legacy gets overlooked because they're not there to self-promote," says D'Onofrio. "This is a female artist, from Vancouver, who has inspired people and is important. It's nice to remember that." Born in Quebec but based in Vancouver, where she's an associate professor at the University of British Columbia, Marina Roy is a cross-disciplinary visual artist. According to her Wikipedia page: "Her work investigates material intelligence in a post-humanist perspective. The evolution of her practice draws upon Freud and Bataille, demonstrating modes of fantasy, eroticism, and compulsion by way of changed symbols and recognized icons." As an artist and educator, Wendy Coburn explored topics of gender and sexuality. At the Ontario College of Art and Design University, where Coburn was a professor, she helped create the school's Art and Social Change minor, and was recognized as OCAD U's "first recipient of the BLG Faculty Equity Award for her outstanding contribution to promoting an inclusive work and learning environment." According to her Wikipedia entry, Coburn's sculpture — including her 2000 bronze statue, Leda and the Beaver — earned attention for how they "explored lesbian life and sexuality." Coburn died in 2015, and creating her entry was a moving experience for many contributors to the Toronto Art + Feminism edit-a-thon. "That page was created at our event last year," says Amy Furness. "Emotions were high." Founded in 1994, Edgy Women is a Montreal festival of underground feminist art — described on Wikipedia as "an annual showing of short, highly physical works by women" — that presents its final edition this March. After its farewell Cabaret on March 5, members of Montreal's Art + Feminism group are hosting a separate Wikipedia edit-a-thon to bulk up the festival's entry, hoping to archive its 23-year history. A long-time educator at the Emily Carr Institute of Art and Design and Simon Fraser University's School for Contemporary Arts, this Saskatchewan-born visual artist is currently the associate director/curator at the University of British Columbia's Morris and Helen Belkin Art Gallery. 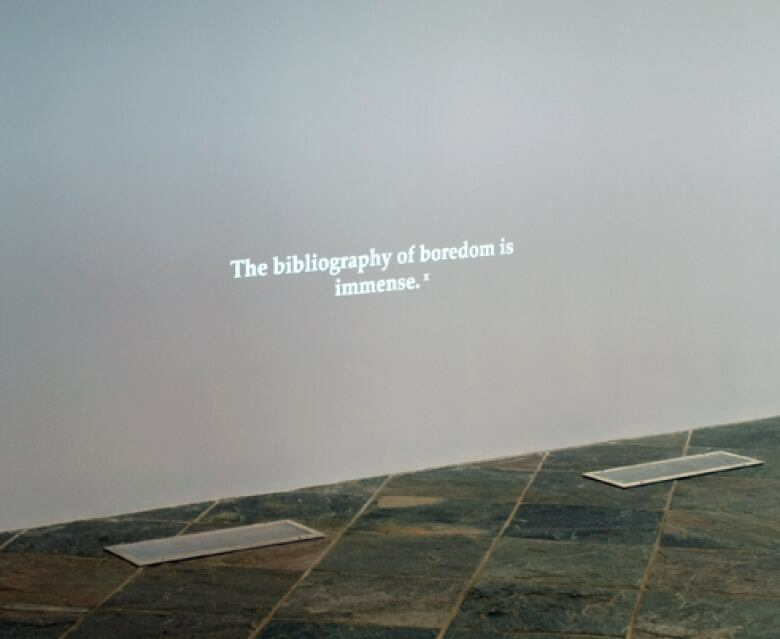 Per Wikipedia, Lorna Brown's art practice "focuses on public space, social phenomena such as boredom, and institutional structures and systems." Says D'Onofrio: "She should have had a page done for her a decade ago." Visit the Art + Feminism edit-a-thon page on Wikipedia to find details on events happening near you.